Mother's Day is less than two weeks away so I hope you have something special in mind for your mama and all the mama-figures in your life. The standard gifts, brunch, and quality time together is awesome but a personalized gift basket can really elevate Mother's Day experience. 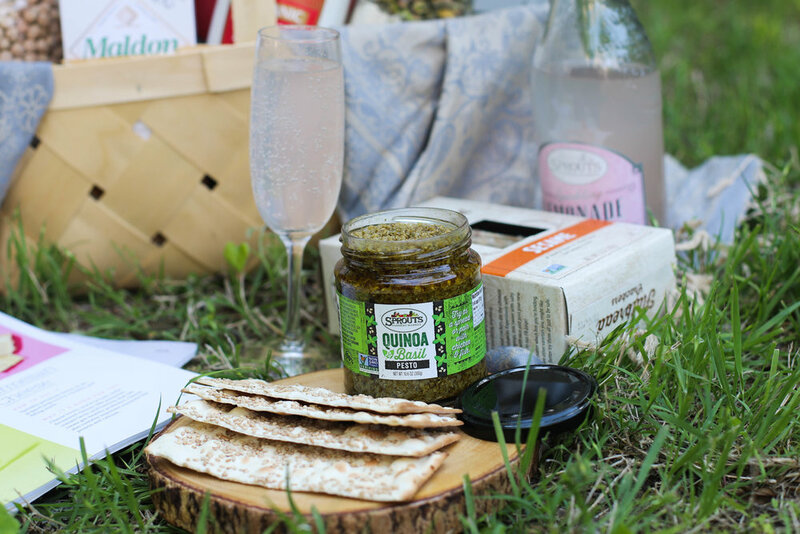 I have partnered with Sprouts to bring Mother's Day Gift Basket Inspiration for First Time Chef; each item in the basket is hand-picked for mom's who are adventurous cooks and are ready for more finesse in the kitchen! My inspiration behind Mother's Day Gift Basket for First Time Chef was to really walk different aisles at Sprouts and find combination of things that are unique, interesting, and familiar. I shop at Sprouts 99% of the time but I often go to same aisles and purchase the same things so it was really fun for me to explore the store with first time chef mom's in mind. In the basket, you will find basic but premium pantry ingredients, DIY jars, snacks, drinks, and of course a fresh bouquet + card. If you are new to the world of gift basket - don't fret. You just need a theme and few supplies to put everything together such as basket (which can be purchased from craft stores or repurpose the one you already have), tissue paper or a cloth along with some small empty cardboard box in the bottom to help prop items in the basket. You can keep the decor minimal or go all out with bows, cellophane bag. ribbons etc. Also, when picking products think about the height, shape, color and size so it is cohesive & visually interesting. So what's in my Mother's Day Gift Basket for First Time Chef? Maldon sea salt flakes which comes from a 135-year-old family-owned salt works on the southeast coast of England called Maldon. This salt is revered by chefs everywhere and it works best as a finishing salt— on roasted vegetables, grilled meat, caramel, simply just before serving. Sprouts Extra virgin olive oil - olive oil is a pantry staple but few things to keep in mind about olive oil esp when there are so many varieties on the shelf - extra virgin, virgin, light, pomace, filtered, cold pressed, stone milled, organic etc. Not all olive oils are created equal so before you pay a hefty price on olive oil, understand the difference between grades and how you plan on using them in your kitchen. Extra virgin is the highest grade of olive oil. As with all virgin olive oils, it is made mechanically, without the use of chemicals or excessive heat and meets some chemical and organoleptic (valuation of food products by a combination of taste (by mouth) and smell (by nose) by taste panels) standards. Since it is unrefined, it has a low smoke point which makes them a great candidate as a condiment, drizzled over fish, meat, steamed vegetables or baked potatoes, in salad dressings, uncooked sauces as opposed to cooking. They also have lower level of oleic acid than other olive oil varieties and more of the natural vitamins and minerals found in olives. Regular olive oil, which is found widely is blend of virgin olive oil and refined olive oil . They are lower-quality oil than extra-virgin or virgin olive oil, with a lighter color, more neutral flavor, and oleic acid measuring between 3-4%. This type of olive oil is an all-purpose cooking oil. Similarly, light olive oil is a refined oil that has a neutral taste and a higher smoke point. It can be used for baking, sautéing, grilling, and frying. Crackers + dips are a must for entertaining so I picked two different kinds - Sprouts flat bread crackers and Nut Thins made with nut and rice which are suitable for gluten-free individuals. They go well on a cheese board or with pesto quinoa which I had no idea existed until now. You guys know how much I adore the bulk bin section at Sprouts for all my nuts, seeds, beans, and other dry goods so I thought it would be fun to make DIY jars so new chef mom's can whip up homemade hummus and bake a fresh batch of pistachio muffins. Instead of just dried chickpeas (which are the key ingredient), I paired it with spicy tahini to add a slight kick to hummus. Did you know Sprouts have their own in-house brand of tahini? There are endless possibilities with DIY gift jars and you can customize it based on what your mama likes such as cookies, hot chocolate, granola, spice blend etc. You simply add dried ingredients to a mason jar then add instructions/recipe to the jar to complete the recipe. Double Chocolate Chip Cookies - so dang good. And for a change, I thought mama should enjoy cookies with Original Macadamia Milk, which hails all the way from Australia. Macadamia has a nutty, rich taste and they makes a wonderful dairy substitute in coffee, and other recipes. And last but not least, I picked Sprouts sparkling lemonade - original & pink because its refreshing by itself or you can use it as a mixer to make drinks. Last year, I got an opportunity to visit Sprouts headquarter in Arizona where Emily & I got to participate in gift basket challenge (we won the challenge too!!) where I learned that Sprouts carry other non-grocery items like gifts, beauty products, greeting cards and so on. Besides food-items, I added some non-grocery items to my Mother's Day Gift Basket for First Time Chef including a fresh bouquet of lilies, greeting card, and food-focused magazine for inspiration in the kitchen. I had such a fun time putting together Mother's Day Gift Basket for First Time Chef and everything in the basket was picked up Sprouts. If you are not sure what to get your mom this year, personalized gift basket would make a very thoughtful present. I hope this basket will inspire you to make a trip to Sprouts soon. If you end up making a gift basket, I'd love to see your creation so don't forget to tag me @foodpleasurehealth on instagram. Gather all the supplies from your fav craft store and ingredients from Sprouts. Lay the basket flat on a floor and put empty cardboard box or riser for height. Cover the riser/cardboard box with tissue paper or fabric. Arrange the ingredients - think about color combination and height to make it visually appealing. Cover with cellphone bag, bows, or other decorations as desired. So what are your plans for Mother's day? This post is sponsored by Sprouts. Thank you for supporting the brands I love that continues to make Food, Pleasure, and Health possible. BE NOTIFIED OF EXCLUSIVE NEW RECIPES, GIVEAWAYS, AND MORE.